After a ‘leaked’ pilot and a great deal of on-air and at-con promotion, Supergirl literally burst onto the scene last October, flying into our homes as the first mainstream television show to feature a female superhero since the days of Lynda Carter as Wonder Woman, back in the 1970s. And as we saw all of the early footage and stills, many of us wondered one simple thing: can it ever possibly live up to the hype? The answer, as with most things, is complicated. In many ways, yes, Supergirl does live up to the hype, and more. Yet in others, it falls short. The real answer lies in which issues are most important to you, as an individual viewer. One of the things I love about Supergirl is that it is what it is, and it doesn’t attempt to be all things to all people. It’s funny, it only hints at ‘darkness’, and it focuses unabashedly on a fledgling superhero who thrusts herself into the limelight and gets more than she bargained for. There are many light romantic subplots, yet they are generally not the main focus of the weekly plotlines. Supergirl is a crowd-pleaser: something everyone can enjoy, family-friendly, and appealing to the ‘masses’. Yet serious comic book fans claim that it lacks substance and is too ‘fluffy’. To be certain, the show has more in common with the 1970s Wonder Woman or the 1960s Batman than it does the DC superhero movies of the past decade. Yet Supergirl embraces this approach, and it is clearly popular with many viewers, given the high ratings it has received. Watching even fifteen minutes of an episode will give you a good idea as to the approach taken by this show, and you can judge for yourself if it works for you. For me, I enjoy watching Kara’s struggle with her sudden catapulting to both fame and responsibility. Her difficulty in juggling her job, protecting the public, her personal life, and having a side engagement working with a secret law enforcement agency that protects the Earth from evil aliens, brings a humanity to the character with which I can identify. Not since Tobey Maguire’s Spiderman have I felt empathy for the geek struggling with real life now made more complicated by the addition of a super-persona. Kara’s problems are real: keeping her job, dealing with family tensions, and yes, struggling with dating, all the while constantly being targeted by evil-minded aliens and an all-too-human business magnate. 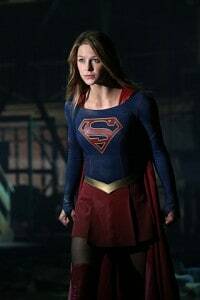 Certainly some of the characters are one-dimensional, being painted as ‘good’ or ‘evil’ with a broad brush, yet clearly the show is attempting to add more depth, bringing shadows of both sides to certain characters, notably Kara’s aunt Alura Zor-El, secret government agent Hank Henshaw, and high tech business tycoon Maxwell Lord. My husband started watching the show with me, but dropped off after about six episodes, claiming that they were too ‘self-contained’, and that he wanted to see more of an ongoing storyline. I can certainly appreciate that, and it is true; the first half-season is less interesting in this respect. But the season was expanded to a full set of twenty episodes after the ratings took off, and it is clear in these later shows that the writers are adding more depth to both storylines and characters. Supergirl, both the character and the show, are growing and changing, and I am enjoying the journey as I watch every week. I hope that you will give Supergirl a chance and see if it is something that you too might enjoy. To join the conversation or see what others are thinking click on the link below for the thread on the FoCC forum.